The Fox Trot provides a good foundation for all dances and is often called the "get-acquainted" or "first impression" dance. In 1913, Harry Fox a vaudeville comedian, introduced a trot to a ragtime song in the 1913 Ziegfeld Follies that pushed other trots into the background. It became America’s most popular dance and remains so to this day as the standard of social dances. Fox Trot music is written in 2/4 or 414 time. The first and third beats are accented in 4/4 time. 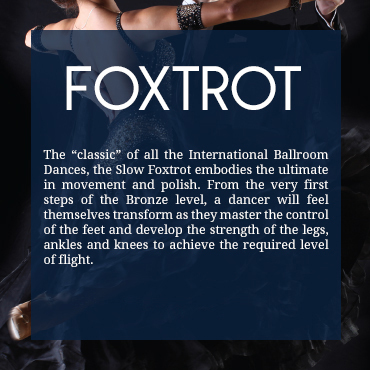 The range of Fox Trot tempos makes it possible to consider Foxtrot as though it were three dances: Slow Fox Trot; Medium Fox Trot; and Fast Fox Trot, also called Society Tempo. Fox Trot has two major teaching rhythms: Magic Rhythm—Slow, Slow, Quick, Quick (SSQQ) and Box Rhythm—Slow, Quick, Quick (SQQ). It Had to Be You — Harry Connick Jr.